Doug Engelbart was a prominent pioneer of the Information Age, whose visionary research beginning in the 1960s and 1970s spawned more breakthrough innovation, repeatedly, than probably any lab of its kind, before or since. His success was rooted in a profound vision for humanity, and in what he considered his most important breakthrough of all – a comprehensive innovation strategy that informed and continuously refined his research agenda. Now we have assembled some of his key lectures, interviews, and video tributes, and invite you to peruse, sample, study – learn from the man himself, in his own words, how he saw the future, what he thought was so important to pursue, why it's still so important to your organization and society today, a strategic approach for accelerating progress, including the paradigm shifts that will be needed, and where to find the points of greatest leverage to fully realize our highest potential on a global scale (all in the face of rapidly accelerating change, of course). 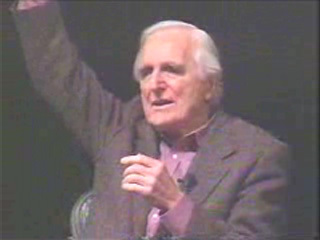 Now you can watch the best of Doug Engelbart presenting his strategic vision and hopes for humanity in a guided tour through his Bootstrap "Paradigm Map". Each video is queued up to begin with the Intro or Overview, and a table of contents is provided so you can sample specific topics. Since Doug's strategic vision is multi-dimensional, and relational rather than linear, it helps to watch him presenting in multiple contexts for the interplay of concepts to become clear. 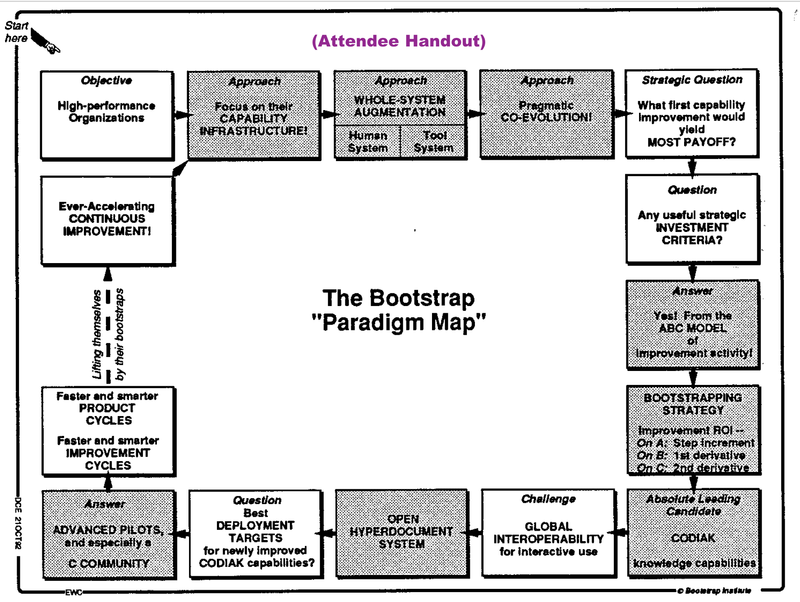 For more on the presentation format, see Doug's Bootstrap "Paradigm Map" page. If we had to pick one for a TED Talk, this would be it. Here Doug unfolds his strategic vision using his Bootstrap "Paradigm Map", including fifteen 'tiles,' each representing a different paradigm that will need to shift to realize the organization's full potential. Depending on the audience, he spends more or less time on selected topics. For complete slidedeck and navigation instructions, see Slides section of our Bootstrap "Paradigm Map" resources portal. Doug presenting at Groupware'92 his vision and strategic approach for transforming organizations of the future, and the important role he would like to see the groupware community play. Follow along with Doug's slides, handout, and paper for this talk. CONTENTS: Intro | Paradigm Map [get yours here] | Importance of Paradigms | Overview | Objective | Capability Infrastructure | Augmentation | Co-Evolution | Most Payoff | Investment Criteria | ABC Model | Recap to this Point | Bootstrapping Strategy | Collective IQ (CoDIAK) | Global Interoperability | OHS | Deployment Targets & "C" Community | Conclusion | BONUS: Don't Let UI Limit High-Performance Users | Lost Opportunity Cost | Dimensional Scaling | Are You(r) Vendors Committed to High Performance? Doug and team co-presenting at a special event marking the 35th anniversary of his seminal 1962 thinkpiece Augmenting Human Intellect: A Conceptual Framework, which drove his life's work. Speaking on the vision and what is yet to be accomplished: Jeff Rulifson, Charles Irby, Doug Engelbart. Follow along with Doug's slides. This three day management seminar predates the interactive paradigm map, but goes into much more detail on each of the topics covered by the map. See Overview and Recap: Six Hypotheses for starters. Refer to our 1992 Seminar website for program, binder of slide handouts and readings, and index to sessions videos. An informal half-day seminar in a unique small group format (recording quality is poor but the content is excellent, and the audio does improve in Part 2). This was a one of a kind seminar, and we are grateful to have any recording, such as it is. See Overview for starters, and refer to our 1995 Seminar website for contents, companion seminar booklet and more. Doug's most recent symposium covering the same topics in detail, with guest speakers from industry and the public sector discussing how the topics are relevant in their fields of expertise. See our Colloqium website for full program with links to session videos, illustrated transcripts, speakers bios, etc. See also Bootstrap "Paradigm Map", Doug's Vision Highlights, toolkits for Bootstrapping Brilliance in your organization or initiative, and more of Doug's presentations and special events at our Video Archive Collection.